I’ve talked a lot over the last few days about the versatility of the X100 series for traveling, and I’ve mostly been talking about the strengths of the 35mm focal length. Today I’d like to talk about one of the weaknesses of this focal length – portraits – and why I don’t actually feel limited by the X100F in this regard. I’m not a portrait photographer. I don’t have any vision for portraits, and I don’t particularly have an interest in them. To be more specific, I don’t have an interest in formal portraits. I usually don’t enjoy taking pictures of people, but I do really enjoy making images of people that I’m close to in everyday life. Call it documentary photography or environmental portraits…or even basic snapshots…whatever. I don’t care about the label – I just know it makes me happy when I get an image that reveals something about a person or a moment that I feel is special. Gear is the least of my concerns when I’m taking these kinds of “portraits”, but if I take a step back and analyze what gear is right for these kinds of images I actually think the X100F is perfect. To get these sorts of images, the prerequisites are actually being there for the moment and being able to capture it. That’s it. At first glance, it may seem like gear is irrelevant given those prerequisites…but it’s actually not. Imagine if you were lugging around a DSLR with a ~80mm portrait lens. How present would you be in that moment with the person you care about? For me, it’d get in the way of allowing the moment to happen…and even if it didn’t, I’d no doubt have to take a step back (effectively removing myself from the moment) to take the shot. With the X100F in my pocket, it doesn’t get in the way of the moment I’m having. And given its wide-ish focal length, I can be at arm’s length to someone and get a pleasing portrait. In other words, I don’t have to remove myself from the scene in order to capture it. As for this particular image, it’s nothing special to anybody but me. To an outsider, it’s just a basic snapshot. But to me, it’s an encapsulation of an important memory. Christina and I went back to Chicago – where we first met and started dating – this past weekend, and at one point we stopped in a doughnut/coffee shop for refreshments. 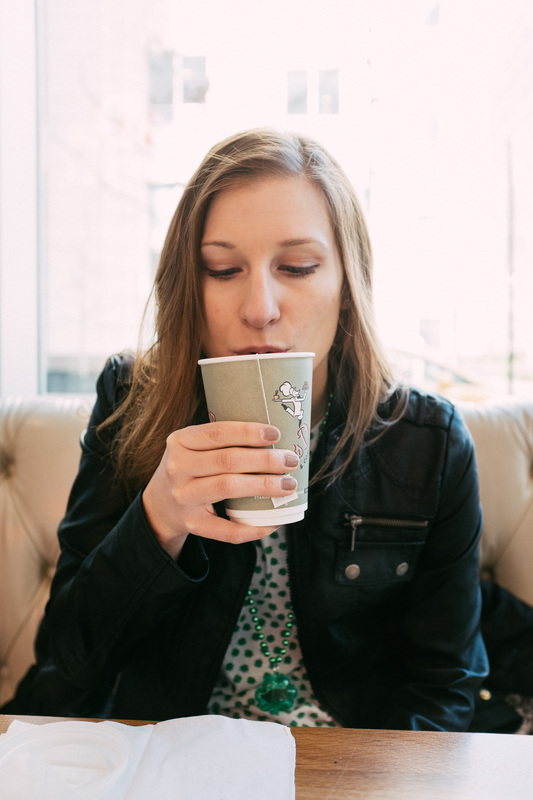 I was battling a cold at the time, and the experience of being semi-sick while in a Chicago coffee shop with Christina sparked a recollection of our first legitimate date. We had gone to the Chicago Art Institute and were grabbing drinks at a Starbucks. We sat there and talked for hours (I was losing my voice by the end of it…thus the sickness connection) about our lives, our families, and so forth. I doubt I’ll ever forget that experience, so when I had a flashback to that afternoon this past weekend I’m glad I had my camera with me to capture a little bit of that moment.